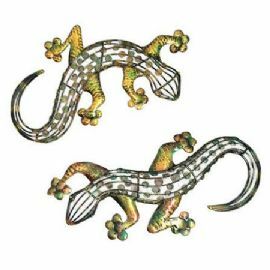 These beautiful Geckos are perfect wall art decorations for your home and garden. Available as left facing or right facing - see photos for details. 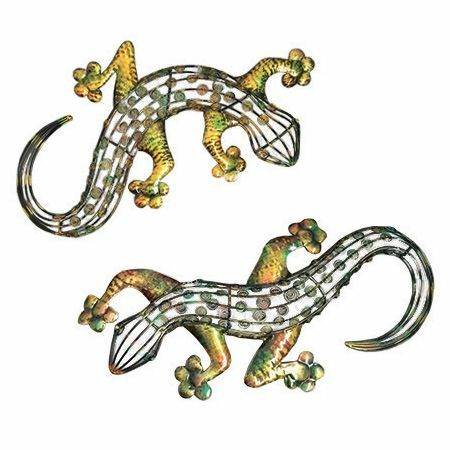 The finish of these Geckos is enamelled, making them ideal for outdoor areas, but they may also be used in the home to brighten up any wall. Made from metal, with multiple fixing rings on the rear to enable the Gecko to be fixed at various angles on your wall, fence or shed. Special Offer - Buy a pair of Geckos (one left facing and one right facing) for a saving of £5.00 - Price £27.00 for both! Please note - the left facing Gecko and the right facing Gecko are a slightly different shape. See photos for details. All prices include Free Delivery.